Im wery proud to tell you all about the year 2011! Amazing Tails 2 BISS Breeder at spesialityshow. Amazing Tails Avalanche has done a great job competing with Mini-Me all the way... With several BOB and CAC placings! Owner: Siv Helen Hennig Till. Multi Ch. 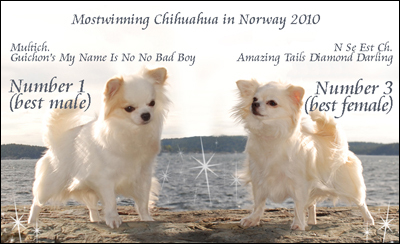 Guichon's My Name Is No No Bad Boy became the best prognecy chihuahua in Norway 2010! and in the list for top progencydog of all breeds he became number 4!!! 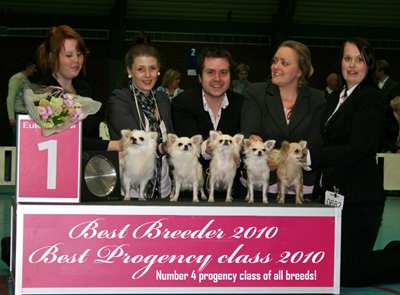 Amazing Tails is also BEST BREEDER IN NORWAY 2010! Multi Ch. 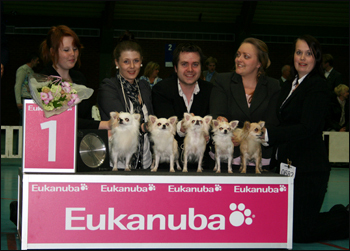 Guichon's My Name Is No No Bad Boy became the BEST CHIHUAHUA IN NORWAY 2010, with a new record score! He's Daughter N Se Est Ch Amazing Tails Diamond Darling became number 3 in total and became BEST FEMALE 2010! We are so proud of our topwinners and that father and daughter made it together! He's Daughter N Se Est Ch Amazing Tails Diamond Darling won champion class and 2 best female with CACIB. Multi Ch. 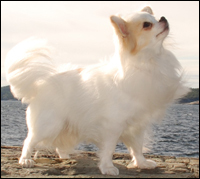 Guichon's My Name Is No No Bad Boy's progency class got BIS 4 and ended up as a 4 best stud dog in Norway of all breeds 2010! After a long journy in car from Norway to Slovenia our Junior male went all the vay to the top. Amazing Tails Baby Be Cool got Exelent, BOB junior and became EUJW-2010 !!! His father Multi ch Guichon's My Name Is No No Bad Boy was number one in champion class got the CC/CAC and became SLO_CH! He also became 2 best male with Res.CACIB so it was almost father and son that got the two titles this year. We are so proud of our boys. Our junior girl Amazing Tails Baby Be Nice became 3'rd in her class with exellent. 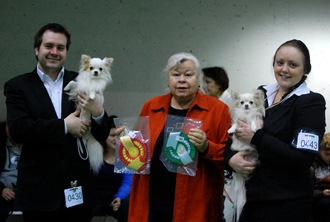 N Se Est CH Amazing Tails Diamond Darling became 3'rd best Champion female with exellent. 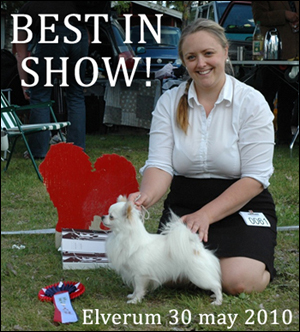 This weekend we went to Estonia on Tallin internationale dogshow. Multi ch. 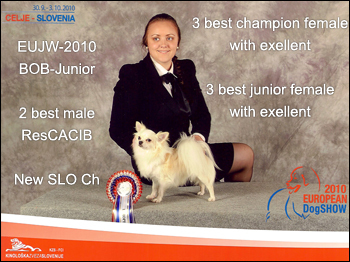 Guichon's My Name Is No No Bad Boy went BOB both days, with CACIB and CC/CAC and can now add Estonian Champion to his champion titles! 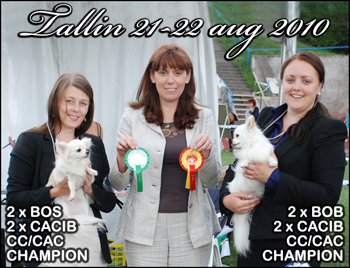 His Daughter N Se Ch Amazing Tails Diamond Darling got BOS both days with CACIB, CC/CAC and is now Estonian Champion to! 2 New Champions in one day! Ranseter Internationel, Sweeden 1 august. short time after Melis got her Norwegian champion title she got the Sweedish title on first try! 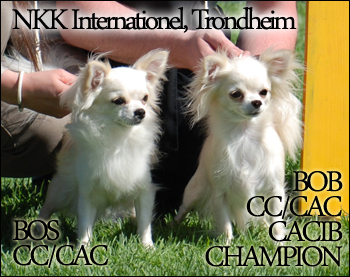 Melis got CACIB, CC/CAC, BOS and became Sweedish champion today. Her father Jace became BOB and got his last needed CACIB and became International champion. We are so proud of father and daugher once again in the top! Short time after her litter sister Amazing Tails First Born Diamond got her last Norwegian CC/CAC today and became NORWEGIAN CHAMPION only 2 years and 3 weeks old! We are so proud of Ibux and her owner and handler Anniken. Ibux also got BOS. We had a great day in Trondheim internationell. Melis from our first litter had just turned 2 years old on friday, and at first try only 2 years and 2 days old Melis got her last NorwegianCC/CAC and became NORWEGIAN CHAMPION, she also got CACIB and BOB. Her half brother Teddy came first in junior class and went all the way to the top and became BOS with CC/CAC (this is his 3'rd international CC/CC) and his just 1 year old! Their father Jace came 2'nd in Champion class and ended up as 4'th best male. Tikken won her junior class to and ended up as 4'th best female! our Breeder and progancy class both got first place with HP! Thank you so much judge: Steven Seymore. Norwegian Chow chow club, Elverum 30may. Jace BOB and BEST IN SHOW. 9 BEST IN SHOW's placings in one weekend !!! 22may: BEST IN SHOW PROGANCY CLASS and our BREEDERS CLASS BEST IN SHOW 3! 23may: Jace BOB and his PROGANCY CLASS once more BEST IN SHOW! our breeders class got BEST IN SHOW 3! Our Progancy class was BEST IN SHOW! and our Breeders class became BIS 3! All 5 dogs from our kennel got a exelent and 2 out of 4 placings in best male and female classes vent to our dogs. Teddy got the internationale CC/CAC at first try! N Se Est Ch. Amazing Tails Diamond Darling was 4'th best female. Chachadi's Spoonful of Heaven got BOB-puppie at her first show! N Se Est Ch. Amazing Tails Diamond Darling was 3'rd best female. Amazing Tails Baby Be Cool got 3'rd best male. N Ch. 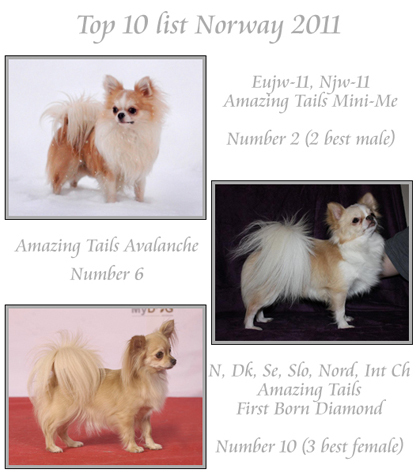 Amazing Tails First Born Diamond was 2'nd best female. Welcome to the family Chachadi's Spoonful of Heaven. 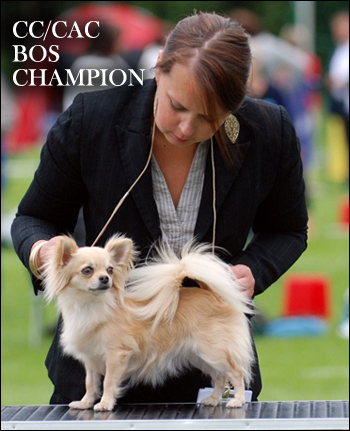 Fantastic day in Rogaland, NKK internationell 11 sept.
Multi ch. Guichon's My Name Is No No Bad Boy got BOB and CACIB and he was picked out in the top 6 in group 9. Amazing Tails Baby Be Cool got BOB-junior both days, and 2'nd best male behind his father with CC/CAC both days. Amazing Tails Baby Be Nice got BOS-junior both days, with 3'rd best female both days, and she got her first CC/CAC! Ch. Amazing Tails Diamond Darling was best female with BOS. Multi ch. Guichon's My Name Is No No Bad Boy got BOB both days. and he also got BOG 3 and BOG 4 ! Jace's Progancy class got BIS 3 and BEST IN SHOW! 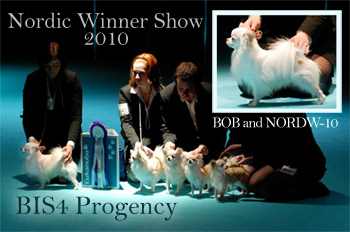 15.08.2010 NKK Oslo, Internationell, Norwegian Winner show! Amazing Tails Baby Be Cool got his CK and became 2 best junior. Amazing Tails First Born Diamond got CK and ended up in 2'nd place in a big champion class. Amazing Tails Diamond Darling got CK and ended up in 4'th place in champion class. Multi ch. 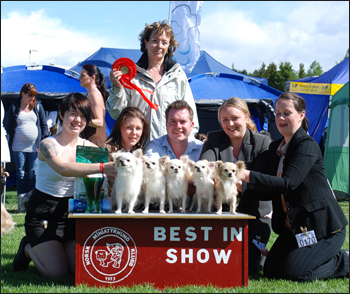 Guichon's My Name Is No No Bad Boy got 2'nd best male and 2'nd runner up to the Norwegian Winner 2010 title. with RES.CACIB. 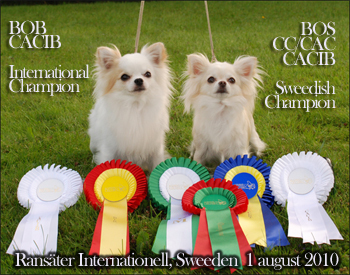 Amazing Tails Baby Be Cool got his 4'th CC/CAC and now he has 2 international CC/CAC. Amazing Tails First Born Diamond got her International CC/CAC and now she only needs to be 2 years old to be a Champion! Jace's Progancy class got once more BEST IN SHOW! To see our full results from the 3days exhibit you can go to our "results" page. Jace became BOS and his son Teddy 2 best male with CC/CAC on his first show as a junior. Our first Progency class got a BEST IN SHOW 2! New design on our website. 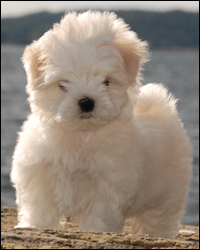 puppies and plans are updated! Jace beacame BOB with CACIB. Melis won youngsters class and got HP. More results and info about the Boxer Club show in our results page! Copyright © 2008 Amazing Tails, Heidi Schulz. All rights reserved.